Over the past year, we've made many strides to better position our academic medical center for the future. We have restructured our leadership organization to ensure optimal integration of our mission of education, research and patient care. We have new leaders in key positions and are actively recruiting to fill others. We have completed the second year of our new Medical School curriculum; we are building our research programs from discovery science to clinical trials; and we are expanding our clinical footprint across Michigan and beyond. Along with these initiatives, we also decided to rebrand our academic medical center as Michigan Medicine. Representing the entire institution, Michigan Medicine includes our health system and its many components, and our Medical School. 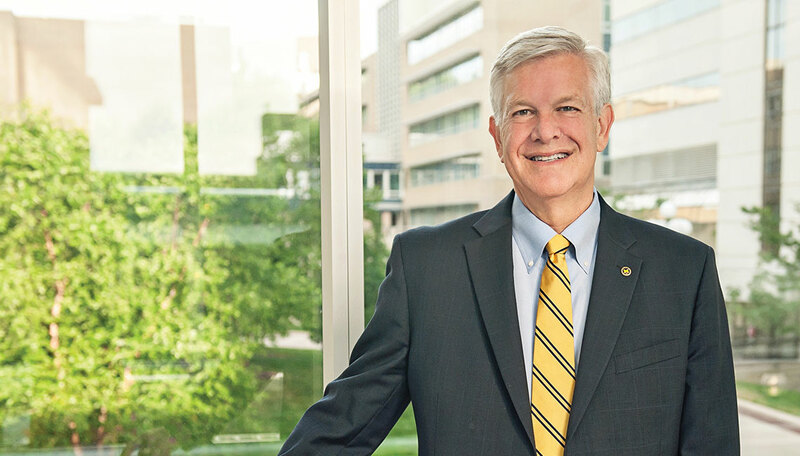 Michigan Medicine better reflects us as an integrated academic medical center committed to educating tomorrow's health care leaders and bringing innovation to health care. These commitments are what make Michigan Medicine unique and outstanding in providing state-of-the- art patient care. Unique and outstanding are best demonstrated by example. In 2012, a newborn came to our pediatric hospital with a diagnosis of tracheobronchomalacia (TBM), which causes the windpipe to collapse periodically and prevent normal breathing. While severe TBM is very rare, it is often fatal. Glenn Green (M.D. 1991), a pediatric otolaryngologist, had long been frustrated by his inability to save babies with this condition, and turned to colleague Scott Hollister, Ph.D., a biomedical engineer, and his lab for help. Teaming with surgical residents and Hollister's students, the group was in the process of developing a bioresorbable device that acts as a tracheal splint. Upon hearing about the newborn, Green and Hollister saw the opportunity to put their invention into clinical practice. They obtained emergency clearance from the Food and Drug Administration to create and implant the splint, made from a biopolymer through 3-D printing. The splint was sewn around the baby's airway to expand the trachea and give it a skeleton to aid proper growth. After three years, the splint eventually was absorbed by the body — about the same amount of time it takes the trachea to grow into a healthy state. Since 2012, Green's team has saved the lives of two other babies with the same condition. All of them are thriving. It is this type of collaboration, between clinicians, scientists, residents and students, that allows Michigan Medicine to do unique and often remarkable things. In the coming year, new initiatives in data sciences, precision health and biosciences will become a reality. These initiatives will build upon a concept very well illustrated by our Institute for Healthcare Policy and Innovation: that by combining the resources and strengths of the Medical School with those of other outstanding U-M schools and colleges, we can accelerate research and our ability to improve patients' lives. These are but a few of the reasons that I am extremely excited about the future of Michigan Medicine, as I hope you are. It would be impossible to conceive what innovations our faculty, staff and students will create tomorrow to drive advances in health care research and delivery. I can't wait to see what's next.